There are some great gadgets out there to take better travel photos with your smartphone, but the short answer? Anything by Olloclip. 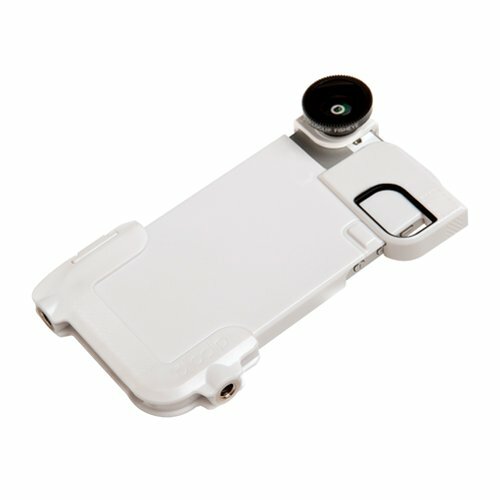 The expert at creating clip-on lenses for smartphones that are fulling an interest in committed phoneography, what Olloclip products have lacked so far has been an all-in-one case – cue the Olloclip Quick-Flip Case. You see, providing excellent clip-ons lenses like the Olloclip 4-in-1 lens kit for iPhone 5/5s and the Olloclip Telephoto + FishEye Lens for iPhone 6/6 Plus is one thing, but actually fishing-out one of these gadgets from a top shirt pocket to use is a faff. Why? Because you have to first remove your phone’s case. If you have the kind of phone case that tightly grips your phone and offers some protection, it won’t come off easily. The Olloclip Quick-Flip Case (which we tested for the iPhone 5/5S/iPod Touch 5th generation) is nothing complicated, aiming to merely replace your ‘normal’ phone case while making your phone ready to accept a clip-on Olloclip lens at any time. It’s slim, it uses dark slightly transparent hard plastic, and it has a flip-off corner that leaves your phone’s camera naked at a moments notice. Even when it’s in place, that corner flip has a huge cutout that gives plenty of room to both the camera lens and the flash. There’ are two more surprise functions, too.With that corner section flipped-off, it rotates the other way to act as a shutter release button for the phone’s camera. All it takes is a nudge from your thumb to take a snap – now that is truly great design. So too is a bottom section that has tripod threads in both sides, so you can mount your phone on a tripod in either orientation. Our only complaint about this otherwise truly travel-grade gadget is that the flip-off corner is a little tight, and doesn’t release quite as fluently as it should.